The world’s oldest person, 116-year-old Gertrude Weaver of Arkansas, believes the key to longevity is treating other people kindly. 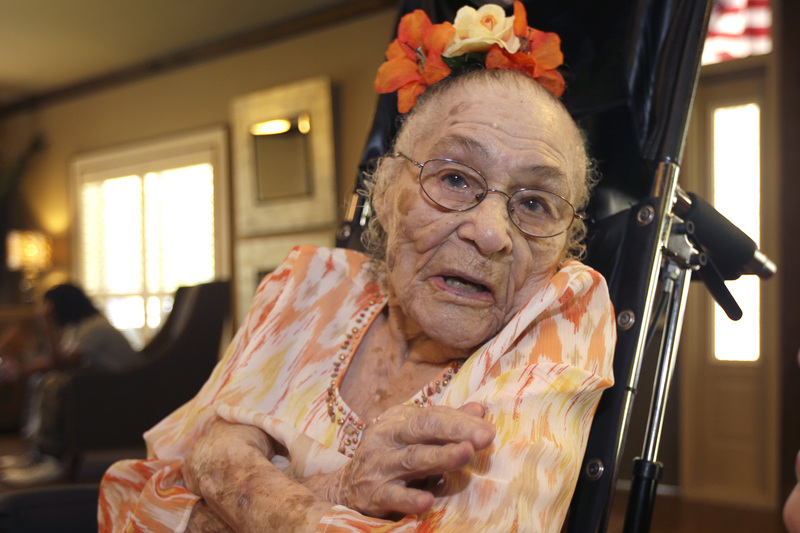 Weaver, born on July 4, 1898, lives at a senior care facility in Camden Arkansas, where she exercises in her wheelchair three times a week and eats three meals a day at the facility’s dining room. “I treat everyone the way I want to be treated,” Weaver told reporters on her 116th birthday when she received a letter from President Barack Obama. She is the world’s oldest person according to the Gerontology Research Group of Los Angeles. The daughter of sharecroppers was born in Arkansas near the Texas border and worked as a domestic helper. After retiring, she lived with her granddaughter and moved to Silver Oaks Health & Rehabilitation Center in 2009 when her granddaughter had health problems, the facility’s administrator Kathy Langley said. “She’s an absolutely amazing lady,” Langley said. Weaver’s 93-year-old son visits on a regular basis. “She said she has been blessed with a long and healthy life because of the way she has treated others,” Langley said. Kindness is the key.. Sure you get taken but kindness is the fountain of youth potion.. I would love to live that long but it’s the genetics also. Reblogged this on Faisal Zaheb. i also read that she wanted president Obama to attend her birthday. I try to treat people with kindness, but I’m hoping it doesn’t extend my life that long. What a marvelous story. I co-managed two retirement residences over five years and became like extended family to the amazing individuals who we shared so much with. When you spend that kind of quality time with the elderly you see them in a whole new light. They have the wisdom of a lifetime of learning, the enlightenment of guidance and grace, the inner and outer beauty of kindred souls…and the innate sense of place and caring. You have to think that for someone to believe in the Golden Rule, especially in such advanced years, they have to be truly special. I know this first hand…for I have learned plenty. I believe it! It comes around. Sowing good seed is paramount if you want a healthy bloom, a rich harvest, unyielding abundance. Thanks for sharing Mrs. Gertrude Weaver with us. Kindness: it’s what makes the world go ’round!